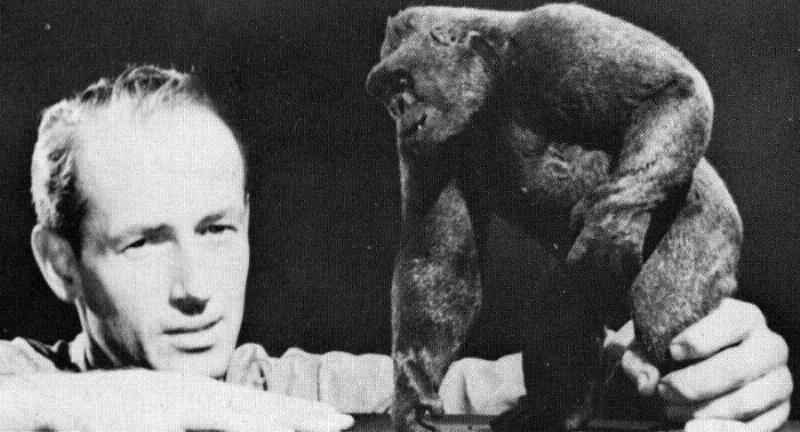 Mighty Joe Young was Ray Harryhausen’s first feature film assignment under the mentorship of Willis O’Brien, the pioneer who brought life to King Kong in 1933. Ray had been working on George Pal Puppetoons for a while, but that was more of a technical task since all the animation was replacement animation. Essentially, the facial features and expressions were already formed, and the animators would place whichever face was needed based on the exposure sheets. For Ray, it wasn’t a fulfilling expression of creativity, but it did give him experience working in production under pressure of deadlines and schedules. FYI: This is my technical assessment of these scene from an observer along with some insight from reading and watching interviews, and my general knowledge of visual effects as a VFX supervisor. I may be wrong in some of my assumptions and I’m totally open to correction from those who know better than I. The general concept for Dynamation, as it grew to be called, is that the projectors are projecting previously shot footage onto a rear projection screen, and advanced a frame for each frame of animation. The animator goes in and moves the characters. He goes back to the camera and exposes a frame of both the live action and the stop-motion onto the negative. And Repeat. 24 times for every second of film. Great care is taken to time out the actions because the animated character is generally responding to live action performances that can no longer be changed. All that can happen is that Joe reacts (or acts to elicit the pre-filmed action). Earlier multiplane techniques that Willis O’Brien used in King Kong or Max Fleischer, Ub Iwerks, and Walt Disney used to create dimensionality into their cel animation were the foundation of Harryhausen’s Dynamation. The difference was that Harryhausen couldn’t create fully intricate matte paintings on glass or have multiple projectors within the budget constraints he was working in. Instead, he would first shoot the plate with the performance the animated character would play against. He would bring that into the studio and project it on a rear screen projector behind the stop motion set. 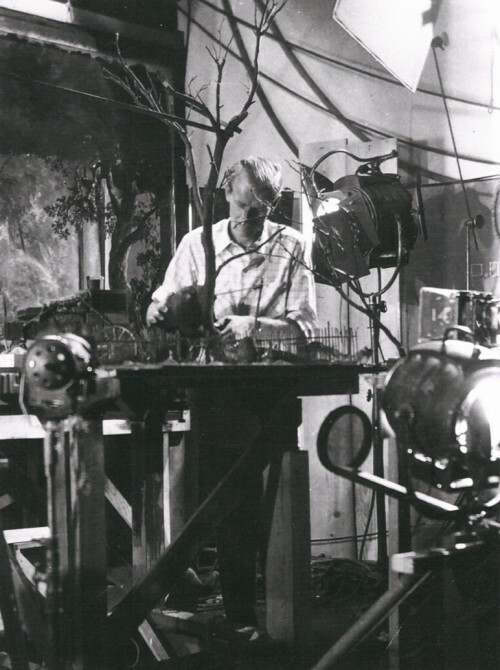 Then he would look through the camera and decide where the screen would be split between live-action and stopmotion, drawing a line on the plate of glass positioned between the set and the camera. Using the reference line, he would go in and paint the glass black, leaving it clear where the creature was going to be. From then on, each frame would expose for the creature. On negative film, the black area would remain unexposed. When the animation was complete for that shot a counter-matte was created — meaning that another sheet of glass was painted black in the exact opposite way the original glass was painted. The film was rewound in the camera then frame by frame, the background plate (or other element) was exposed onto the film into the hole that was left on the negative the first time around. In this way, Harryhausen could have his creatures moving both in front of and behind elements in the scene. They would develop the film, and look at the dailies the following day. If the shot looks good, then it was final. Optical compositing in the camera. If something was wrong, it was back to the drawing board and start from the beginning. Let’s take a closer look at a scene with Joe. The first scene that introduces Joe seems pretty innocuous … at first glance. Joe harasses a lion that has been caged by a group of guys who are gathering lions for a night club in Los Angeles. The background is a matte painting split in with live action footage shot for the scene. At this stage in his career, I’m not sure if Harryhausen was supervising his own plates, but if not, I’m sure O’Brien would have been. The footage is projected onto a background behind the diorama that holds Joe and the two wheeled cages. It looks like the foreground brush is a painting on glass, and then another plate of the river is being projected. The lion inside the cage was shot at an animal preserve in Tarzana and was projected onto a card inside the miniature cage. Joe begins by childishly taunting the lion in the cage. He pounds his chest in gorilla like fashion. 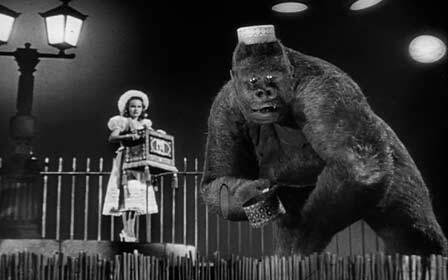 Harryhausen had made studies of gorilla behavior using an amalgam of three gorillas, mostly basing him off Gargantua the Gorilla housed in the Chicago Zoo. Animal behavior and the observation of it was something of an obsession (like others after Ray, like Phil Tippett), and its apparent in the subtleties of the performance. As Joe switched from being bipedal to moving around on hands and legs, you notice the slight shift in weight. Joe moves into touching and pushing the cage. The lion roars viciously in response. But, like I mentioned before, even though the lion seems to be reacting to Joe, in reality, Joe is being animated to time with the behavior of the lion. I’m pretty sure there are trainers above the real cage actually taunting the roars out the lion. Joe reaches around the cage curiously. 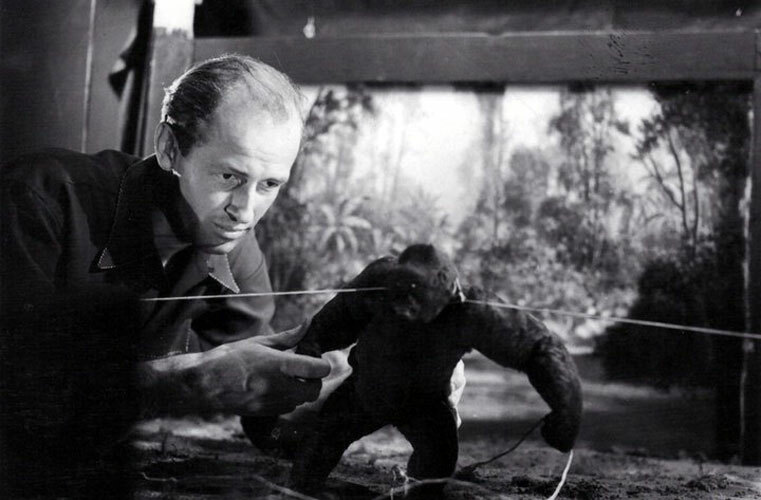 Harryhausen keeps the performance playful, making sure that Joe isn’t coming off as a threat, but more as an inquisitive child. But when Joe reaches around the cage, the lion lunges and bites his hand. Joe, wide-eyed in pain and surprise, examines his hand. And slowly his pain turned to anger. However, he doesn’t respond immediately. He turns to the lion, shifts his weight, takes a couple of steps back, and rears up on his legs. A less insightful (or more lazy) animator would have had Joe react immediately. There is a LOT of additional animation to build the change of emotion. Harryhausen has done exactly what he needed to – place himself into the position of Joe and let himself feel the waves of different thoughts. Keep in mind that this is being animated straight forward. No roughs, no in-betweens, no scrubbing back and forth, no checking your work. He starts at the beginning and ends at the end, sometimes making decisions before the work starts, but more often than not, building the choices as he animates. After a cutaway, we come back to Joe, pounding his fist in the ground in ultimate defiance, while the lion continues to roar. Then he steps to the cart and pushes it up and over. Now, both Joe, and the cart are being animated a frame at a time. This is timed to coincide with the footage of the lion, which, also, was being pushed up and over for real. So, not only the timing of the shot, but the change in perspective has to be matched. As the cart finally is falling onto its side (again, a frame at a time, requiring the cart to be either suspended from above or propped up from below), Joe is going through a secondary set of actions, walking around, and following the cart, ending with another pound into the ground. Joe doesn’t attack the cart immediately. He knuckles around to one side of it and rears back like he is assessing his next move. Then he reaches down and pulls the cart slightly in his first try, and pulls it up a little bit on the next, letting is drop down to the ground, where is rattles back and forth. Nothing about stop-motion is serendipitous. Everything is thought through. The first little pull. The second lift and fall. The rattle of the cart as it lands – as Joe steps back and observes the action — animated at the same time. Frustrated, Joe breaks the cart with his fist. We now go from two things being animated to many. Joe, the Cart, and all the little broken pieces that Joe breaks off. All animated one frame at a time. All needing to be kept track of. Joe doesn’t keep pounding though. He pulls, lifts, rips, throws pieces of the cart around. The complexity of the shot increasing with every action. And it doesn’t stop there. The hole in the cart releases the lion, which is now a stop-motion puppet in the same space as Joe. The lion leaps out to try and escape, its front paw slipping on the edge of the cart, its tail flailing behind it. Joe grabs at the lion as it jumps down. All these actions happen simultaneously – again, each move kept track of for each frame. The cart is used as a split between the puppet lion and a real lion that runs off into the jungle. Joe makes to pursue it, but again, Harryhausen doesn’t take the easy route. Joe crawls on top of the cart, pulling its balance one way, breaking more boards that fall away. He grabs onto the wheel of the cart that rotates back and forth under his shifting weight. And then FALLS OVER the cart, pulling it some of the way with him. The choice of the fall seems to stay consistent with the awkward, childlike behavior that Harryhausen established at the beginning of the sequence. Joe gets up, and for good measure, picks up a big rock and hurls it toward the lion, and then makes pursuit. This is our introduction to Joe. There are no wild camera moves. No explosions. No huge frights. 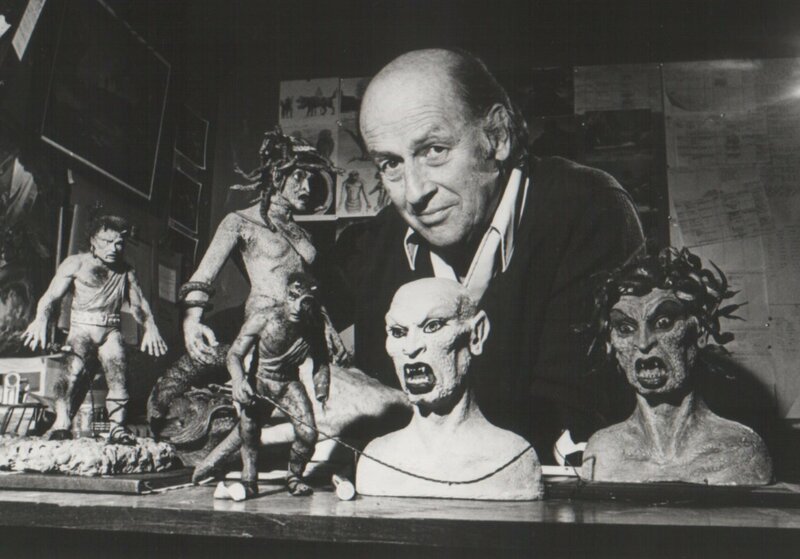 There is only Joe, and Joe’s personality…instilled into him by a young animator named Ray Harryhausen.